This baby is going to need help getting out alive. She's located at Carson Shelter. She needs to be in a home. She's a pretty small girl. PINKY is a shy gal that needs a special someone to bust open that shell of hers. She's in a scary environment so she's looking for someone she can trust completely. In a warm bed and loving home, PINKY would fit right in with her new family. This little lady came in with no tag or chip and she needs help now. She has the cutest underbite! Please SHARE for her life, she's SUCH a cutie and a FOSTER or ADOPTER would save her. Thanks! 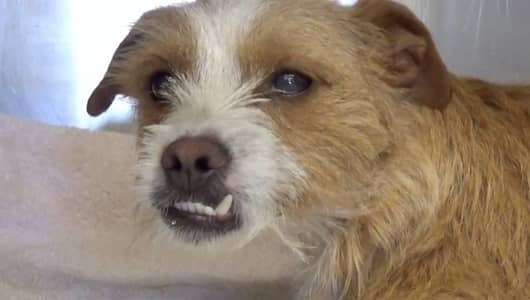 My name is PINKY and I'm an approximately 2 year old female Terrier. I am not yet spayed. I have been at the Carson Animal Care Center since 3/31. I will be available on 4/4. You can visit me at my temporary home at C404. 0 Response to "Going to be killed for fearful and shut down, pretty small girl crying for help"